I’ve known for some time now that I have some amazing friends. I never in a million years could have foreseen the awesomeness that I was about to engage in on June 19, 2010. I eagerly gave out my open dates for a shower in June. I agreed to the desired location. I anxiously awaiting the date circled on the calendar. During this whole process, I never envisioned what the actual day would look like. I didn’t think about decorations or gifts. I thought about the meaning of the shower. I thought about the type of items that people were buying – baby things! I thought about how the nursery would look after an afternoon of fun. We hadn’t spent much time or money buying things for LBL because we knew others would buy us some things and probably because my husband was still in a bit of a procrastination mode. He was accepting of the fact that my belly was getting larger and larger and the kicks were getting stronger and stronger. But, was he willing to turn his house into a colorful maze of baby things? Well, not just yet! The afternoon of June 19 came and I got dressed up in what was comfortable but also semi-dressy and waited for my ride. (Ok, really I didn’t do any waiting. I barely finished doing my hair when she showed up.) She drove me to a restaurant that I’ve been to numerous times over the years. 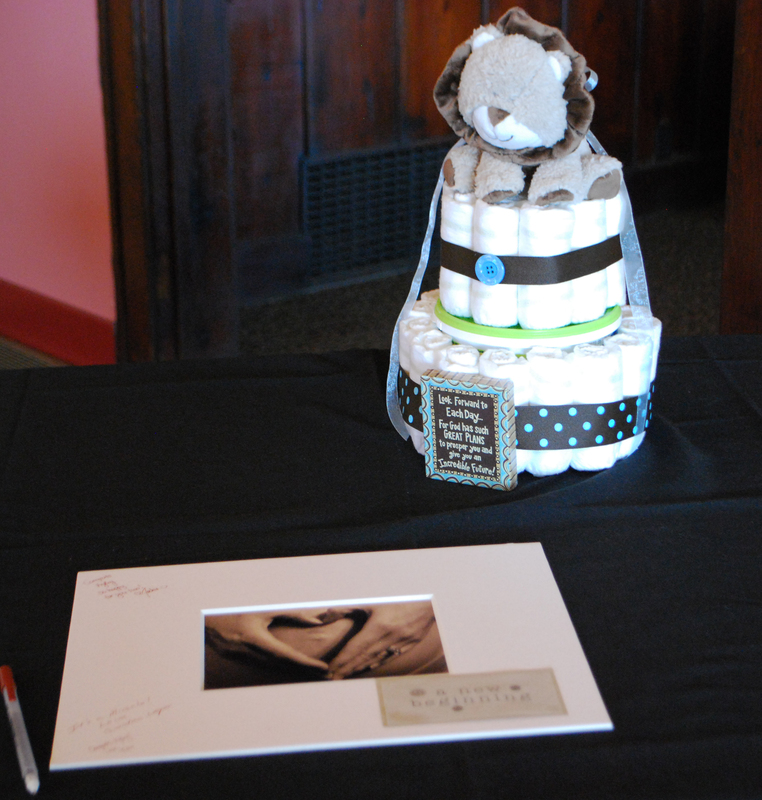 When I walked in I was amazed at the guest “book” table with a diaper cake and matte picture frame for guests to sign. And inside of that picture frame was a picture my husband had taken! He had gone into stealth mode (ok, she had gone into stealth mode) during a recent weekly photo shoot. He suggested a different pose, which she had requested he take. Had I not suggested the photo shoot, I would have known something was up. Instead, I thought it was adorable that my husband was branching outside of his normal routine to suggest things that weren’t his usual forte. Later I would see the guest “book” in the frame and it was even more beautiful! I can’t wait to get it up in the nursery. Next, I walked into the “party” room where I was even more amazed. I didn’t know where to look. My eyes went from the tables and awesome decorations to the gift table. Pictures do more than words, but I need to use some words to express just how amazed / thankful / blessed / excited I really felt. I’d had two bridal showers that were all about me, but it’s not every day that your friends and family shower you with blessings. It’s not every day that the attention is on you or your baby. It was an out-of-body experience to realize that this was all for me and Baby Leger. 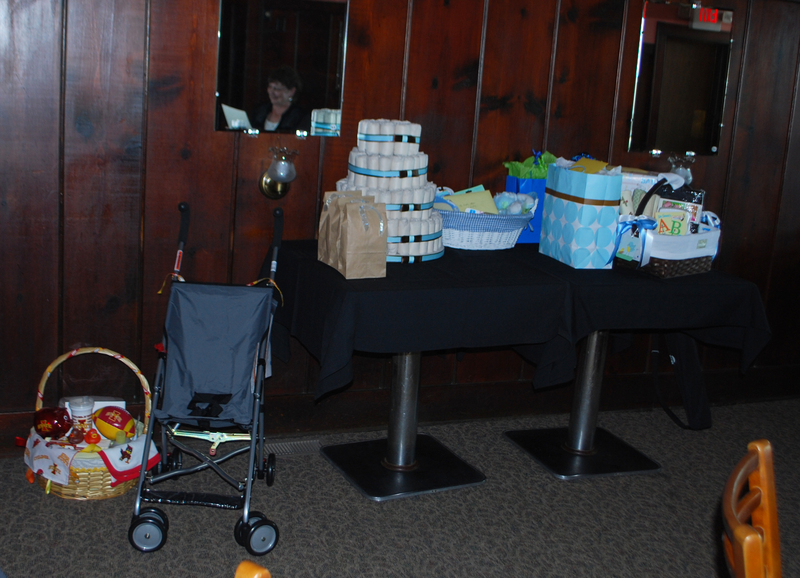 The gift table was decorated with an even larger diaper cake! The diapers were a tan color that also matches the nursery. 🙂 All diaper cake rows were held together with brown and blue ribbon and a button. All ribbon were different forms of solids or dots and attached with different buttons. I was amazed to see all the blue gifts and smiled to myself because everything matched the nursery (or boy theme)! You can see the gifts from my fabulous host next to the table – an umbrella stroller and Iowa State Cyclone basket full of goodies for LBL. The table decorations were so cute! Buttons on blue paper for every table. 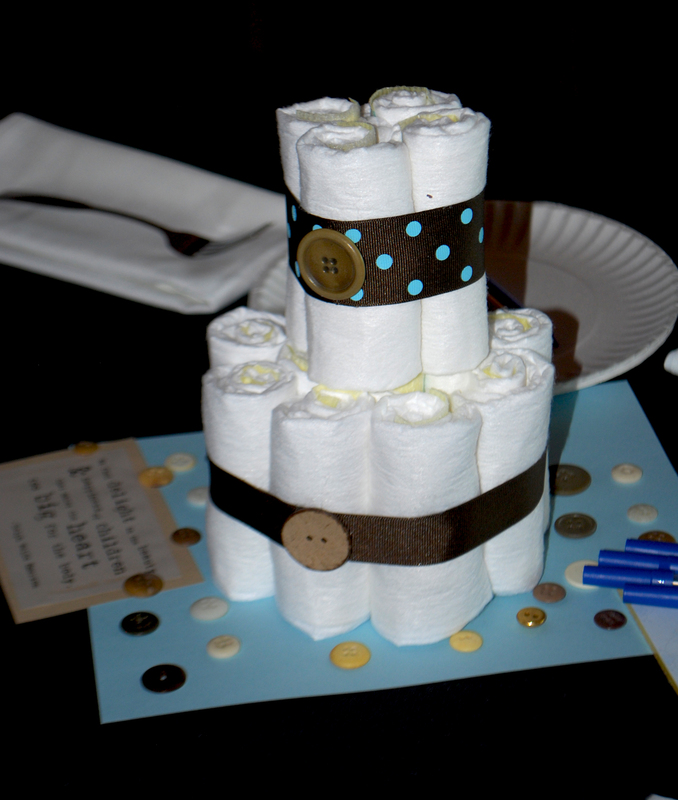 And on top of that, each table had a diaper cake of its own! Blue and brown crayons were laid out for the game. Small notepad stationery with Leger on them were also set out for another activity. Along with all of these things were cute little scrapbook sayings that match what is on the corner of my picture frame. First game: take a paper plate and put it on your head. Using one of the crayons, draw Baby Leger. I got to pick the top artists and they got a goodie bag. This was a great game. Now I just need to come up with a cute way to display them, or at least a couple of them, because they do match the nursery. The other activity was done while I was opening gifts. Everyone was to write down a piece of wisdom or encouragement for me. Anywhere from a mother’s experience to encouraging words from those without children. This is another thing that will be awesome to keep in a memory box. I am so thankful for the wonderful gifts we got, but to me it’s not about the gifts. It’s about the friends and family who came to the shower or have sent me gifts. It’s about those who showed me how important I am to them and traveled from far and near to be at my shower. It’s about the loving friend who spent a lot of time making my baby shower perfect. I can only imagine all the time and effort she put into planning this baby shower for me. Not only did she spend time planning it and making the invitation perfect, but then she spent hours making diaper cakes and coming up with creative games and table decorations. (Plus, she made a Cyclone basket of goodies!) She thought of every detail and I can’t express how perfect she made it. She took an already special day and made it into a well-organized party! 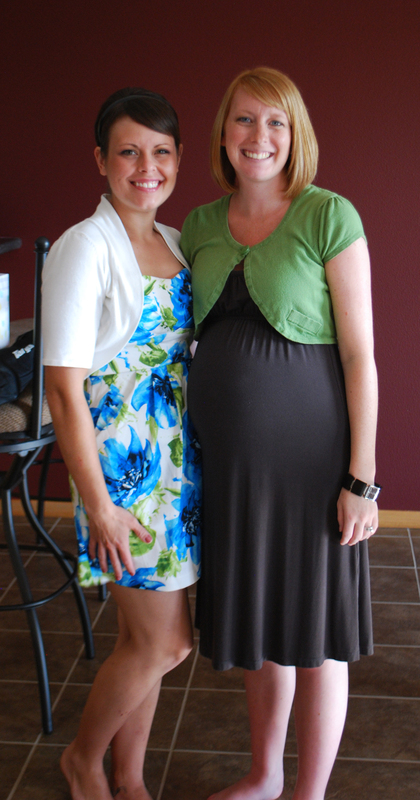 Thank you, Jonell, for hosting a baby shower that will remain in my memory as a wonderful part of this pregnancy! This entry was posted in Pregnancy and tagged Baby shower, Pregnancy by Kyley Leger. Bookmark the permalink.